There are thousands of people on the tribal housing loan waiting lists and tribes simply do not have the large amount of money to finance everyone at once. So how can tribes get tribal members into home loans without the huge up-front home loan financing/capital (money) to do so? The answer is through properly created charitable Down Payment Assistance Grants to get your foot in the door so you can buy your home at low interest rates and utilizing the lending market for the rest. If you want to buy and home, I would not wait for the tribal housing home loan program because they are limited to 10 homes per year for elders, 10 for non-elders, and 10 for vets. Yeah, I said it, only 10 for each group. There are readily available grants in most of America to access financial help you get into a home called Down Payment Assistance Grants (also known as DPAs). Some grants are small and local, while others can be regional or national, and go up to $10,000, if you qualify for a home loan already. The Ho-Chunk Nation offers a DPA grant for enrolled Ho-Chunk Nation members through the General Welfare for Housing Program and applications are readily available on line for you to print at http://www.ho-hunknation.com/publicDocuments/05.17.2017_Down_Payment_Assistance.pdf . In addition, we are fortunate enough to have access to a secondary DPA program known as a benevolent DPA Grant through the Ho-Chunk Housing and Community Development Agency (HHCDA), also in the amount of $10,000. The HHCDA is a tribally-chartered non-profit to aid low income tribal members in obtain clean, safe and affordable housing. The HHCDA Grant is available for low income-eligible tribal members and can be used at the same time as the Housing DPA, so a tribal member can effectively access up to $20,000-$60,000 of grants to garner safe, clean and affordable homes. In order to obtain the HHCDA Grant application, feel free to call (608) 374-1245. I know that this article already sounds like a commercial, but it is not. It is intended for strictly educational and informational purposes, and not legal advice. Nothing in this article is intended to create an attorney-client relationship with the readers. It is just a collaboration of thoughts, programs, loans and ideas all put together to get you on the path to homeownership. Every day, many tribal members contact me and ask how to buy a home. These very basic steps are being provided to you to educate you at the beginning of your journey. It would be wise to take a homebuyer education class offered by your local housing programs, banks, credit unions or NAHASDA/HUD organizations before proceeding with a home purchase, though it is not necessary. 1. You first need to check your credit score. You can check your score, FOR FREE, through a website like Credit Karma or FreeCreditReport.com. I know many people who were too scared to check their own credit, but you will need to get past this fear and just simply do it. You will never know where you stand until you do it. You may even be pleasantly surprised. Never be embarrassed to take control of your credit and doing nothing about it only delays your opportunities. 3. Third, once you feel your credit score is “good” (does not even need to be “excellent”), you will need to go to a lending institution and fill out a credit application for your home. The lending institution will review your loan application and see what loan(s) will fit you best. If you are a Veteran, you may want to seek out a VA Loan at this initial point as these loans usually provide very good rates, almost always locked rates, and may not require any down payment or monthly private mortgage insurance (loan insurance that can cost up to $200 per month). There is a terrible myth out there that once you obtained a VA Loan in the past, you are ineligible for another one. Wrong. Veterans can get a VA Loan multiple times, I have seen it happen and I literally have to explain it repeatedly to Veterans because this myth is so prevalent that I fear it serves as a barrier to many Veterans getting a home a second-time around. 4. Make an appointment with a lending institution. If you are married, bring your spouse as forms such as releases need to be signed by both parties with identification cards because of the Patriot Act. Dress clean and business casual, and get there early, and bring all of your documents with you such as the past tax filings for three (3) years, your income work stubs--at least four (4) weeks-- and proof of all other income coming through your home such as disability, VA compensation, alimony, child support (court orders) etc. Do not forget to have your State Driver License, or State ID, SS Card and Tribal ID. The loan officer will ask you a series of questions and answer each of them as best you can. Plan to be there for about an hour. Shut off your cell phone and pay very close attention to his or her statements as he or she will take you through the process and may blurt out free ways for you to fix your credit or how to get the loan! If you get approved, it is usually called pre-qualified, and gives you an idea of how much you will be allocated for your loan and what to shop for. 6. There are also several other loans available out there in the market for first-time home buyers. If you have time, check out some websites like VA Loans, WHEDA, FHA Loans, Native American Direct Loans, Good Neighbor Next Door Loans, Fannie Mae or Freddie Mac loans and even Energy Efficient Mortgage (EEM) Loans. I suggest that you try to talk to at least two lenders to compare and price shop what is out there, if not more. Remember, most loans are 30-year loans with a fixed interest rate. However, some home loans are adjustable rate mortgages (also known as ARMS) that could suffice, if the rate is low enough and stabilized (I have seen credit unions offer these) and some customers never had a rate adjustment from the initial loan execution date. 7. Pay attention to the lending market interest rates. The first question I get is “What does that mean?” It means that you may want to check when the interest rates are dropping and watch it daily, or listen to the trends on the news or internet. 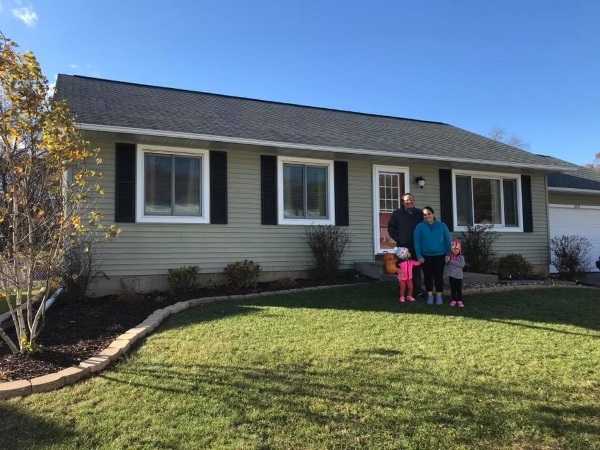 Obviously, the best interest rate for a Ho-Chunk tribal members is the General Welfare Ho-Chunk Nation Home Ownership Program rate, which provides a tribal interest rate for home loans at a simple 3%, but that is very limited to 10 loans per year and the wait-lists are long. So you could wait a few decades for that, or get started now. The lending market’s prime interest rates fluctuate with the economy, and sometimes they plummet down to 3.5%, so you are not getting that much better of deal in the long run with the tribal interest rates at 3% if you can catch a low prime interest rate day at 3.5%, so that is why you need to pay attention to the market. 8. Pay attention to your local real estate market. Your dream home may go up for sale and pass you by, if you let it. Watch the market daily. Timing is everything. I suggest spending some time perusing zillow.com or trulia.com to find out what is on the market, how much it costs, and determine what can be a diamond in the rough. Right now, in my opinion, it is a buyer’s market, meaning home sales prices are driven very low and are very competitive so you can get a darn nice home for cheap. At other times, it may be a seller’s market where you can sell high but luckily enough, it is still a buyer’s market for now. I suggest trying to get familiar with what you want and do not want, what you can afford and not afford, and what you foresee in your future. For example, if you have seven kids, you may want to live by the schools to save on travel back and forth daily or several time per day if they are in afterschool athletics. 9. Start searching for your dream home or designing your home with a local builder, even if your credit is not ready yet. It is never too late to start your homework. 11. Once you get your credit score up, get pre-qualified for a home and find a home you like, or design and purchase blue prints (if you are building a new home), you are ready to get rolling! 12. If you are building a new home with construction, consider applying for other tribal grants for needs like heavy equipment, etc. from the Ho-Chunk Nation Housing Department. 13. The next step is to get an appraisal, which will cost you about $200-$300, out of pocket. Your lending institution will choose your appraiser and bill you or take your payment prior to hiring the appraiser. This is a key step in determining how much money you will spend on your home based on your credit score. Expect it to take 3-6 weeks to get your appraisal in hand for loan processing. 14. Some lenders will require a water test prior to purchase, but not all. For example, my friend got a VA Loan and a water test was not required, but with the conventional lender he was using at first, it would have been. Your lender tell you to obtain a water test or may give you the names of who is approved to test your water. This can cost anywhere from $30 to $250, depending on how invasive the test needs to be. Most tests check for nitrates and bacteria. 15. All lenders will most likely require a home inspection from a certified home inspector. This is a super-important step in the home purchase process that must be kept in mind at the very beginning of your search for a home. If it is glaringly obvious that the home you want to buy is not habitable (not a safe living condition), you will need to find another home, or explain to your lender how you could fix up the home with your home loan and you will most likely need to have your construction estimates in-hand already. Home inspections can cost anywhere from $300-$500 depending on the size of the home. They will tell you if your home is structurally sound, and just about anything and everything wrong with it that you will need to know, for example, the home may need a new roof, have leaky faucets, have a termite infestation, a high mold count or a high radon gas in your basement. 16. Now that you have reached this far, you are ready to apply for a DPA Grant. Don’t forget to apply for the Ho-Chunk Nation DPA if you are an enrolled tribal member. You will need to have some idea of your closing date and bank wiring instructions for the program to process your grant. You will also need to sign several forms to stay in conformance with your grant guidelines. For example, if the tribal grant requires five (5) years residency in the home and you breach that guideline, you will need to repay that grant back. Also apply for the HHCDA DPA Grant to see of you are income eligible. Finally, google your local housing programs and see if there are any other grants available for first-time homebuyers, disabled homebuyers or low-income buyers. I know of one person who was able to utilize $35,000 in DPA grants from many programs to purchase her first home because she was methodic, resourceful and enthusiastic….very impressive. These are just the very first steps in getting yourself into a home. Note that not all people are good candidates for home purchases and some people enjoy the comfort of renting for decades with no homeownership. They do not like having to purchase a new refrigerator, stove or furnace if they go out on them and would rather have the landlord do the snow shoveling or pay the property taxes. That is understandable, but with the rental rates being over $600 per month nowadays, and with a monthly mortgage being about the same on a starter home less than $90K, many would rather own than rent to increase their net worth. In closing, I hope that this information helps you get the thought process started for home ownership. Good luck, you got this!